Have been playing for a long long time, and love the game. Recently I found a game killer. When I progress to a certain point, either when I learn x amount of tech, or when I learn it more than once, the tech tree collapses from then on and I am no longer able to build new tech. Heck, if I lose a component through damage I can't even replace it. If my hydrogen pod goes out, I can't collect any more fuel. Gamekiller. Yes me too. This is really, really annoying. Can someone help please? I am also getting this playing on ipad. It has happened in two seperate games. I think it happens when I have researched all the technologies. 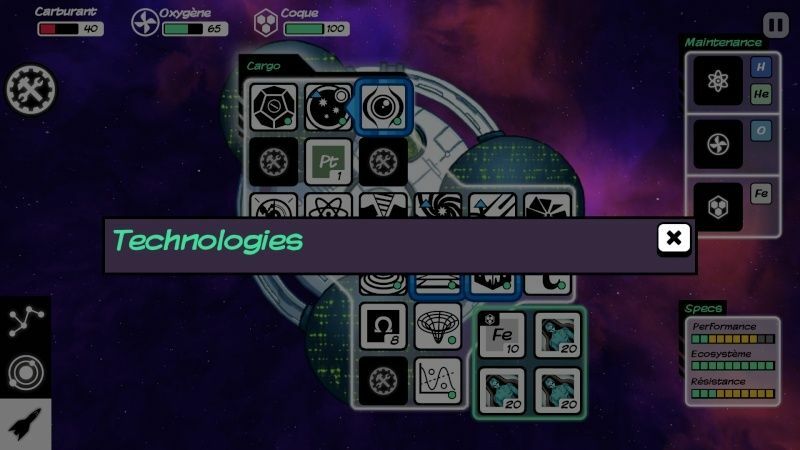 Once this happens both the "tech" sidebar button and clicking on a spare spot in the ship result in a window just saying "technologies" as per the screenshot posted by Claudio. I've played six games since posting this and every single one has the same issue. I like the new update, but something horribly went wrong with it. I'm sure it was unexpected, but it really took the fun out of the game. Needs a patch fix, or game is dead. Help me, Mi-clos Dev Kenobi, you're my only hope. The guys answered me on Facebook, said they're on a game convention til end of week, will look the problem afterwards. I have the same problem v 2.3 on ipad air 2. Any resolution yet? It took me a long time to find people with the problem... yup I got this bug too. Game killing bug, I really hope the devs get a fix for this soon cause I just can't bring myself to restart with the biggest ship and perfect resources. I'm using it on an android, galaxy note. What's especially difficult is that this is the first time I've ever broken free of the "I'll never spend money on an app!" mentality and spent 5 bucks on this awesome game, only to have it break when I'm near the finish line. Is there a fix for this? Do they not read this forum? I'm lost for answers I mean this has been reported four months and it's game braking, but no fix? W t h! MrWizerd wrote: Is there a fix for this? Do they not read this forum? I'm lost for answers I mean this has been reported four months and it's game braking, but no fix? W t h! They fixed this months ago. Make sure you're running the most current version and you shouldn't have any more issues! Good luck! The problem is that I own the game through humble bundle, and according to it I am using the latest version. So if they have not updated the version on humble bundle then I am sol unfortunately.